Our rustic log camping cabins are perfect for those who love to camp, but desire a little more protection from the elements.They all come with electricity, lighting, beds, heaters, a small refrigerator, and a counter with stools. You will need to furnish your own linens. All cooking is done outside on the charcoal grill, or the camp fire. 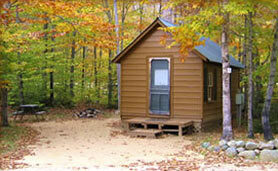 There is no plumbing in the cabins, however the bathhouse and dishwashing are close by for your convenience. 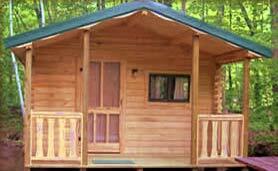 We have both One and Two room cabins. The One room cabin has one double bed and one bunk bed. 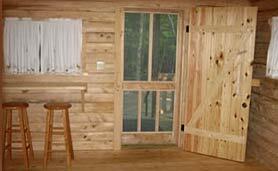 The Two room cabin has one double bed in the main room and two bunk beds in the back room. No more than 4 adults, please. 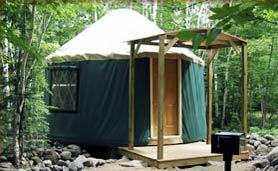 Our modern yurts are unique adaptations of the round dwellings used by Mongolian nomads. 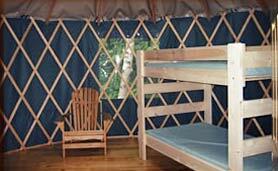 They are 16' in diameter and will sleep 4 (1 double bed, 1 bunk bed). The yurts are not equipped with electricity, however the windows and dome skylight will provide light during daytime hours.